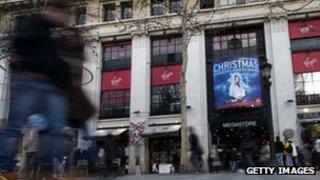 Virgin France is to declare itself insolvent, the latest music chain to fail against a backdrop of consumers shifting to buying music online. The firm - not affiliated with Richard Branson's Virgin Group - has 25 stores in France, including a flagship outlet on the Champs Elysees in Paris. Most have been struggling for a number of years, having been hit hard by the big growth in music and film downloads - legal and illegal - and by the rise in the sale of chart CDs and DVDs by the big supermarkets. Our Price, Tower Records, Virgin Megastores, Zavvi, MVC, Music Zone, Andy's, Border's and Woolworths are all well-known names that have disappeared from streets in recent years.